Apple has seeded and released the third beta version of iOS 8.4 Firmware for iPhone, iPad, iPod Touch and Apple TV devices. The official iOS 8.4 Beta 3 (Build: 12H4098c) and Xcode 6.4 Beta 3 (Build: 6E23) Updates to iOS developers and non-developers (general public users) are available instantly for installation and upgradation. The Direct Download Links of iOS 8.4 Beta 3 for iPhone 6 Plus, iPhone 6, iPhone 5S, iPhone 5C, iPhone 5, iPhone 4S, iPod Touch 5G, iPad Air 2 6G, iPad Air 5G, iPad 4G, iPad Mini, iPad Mini 2, iPad Mini 3, iPad 3G, iPad 2G and Apple TV 3G are appended below. 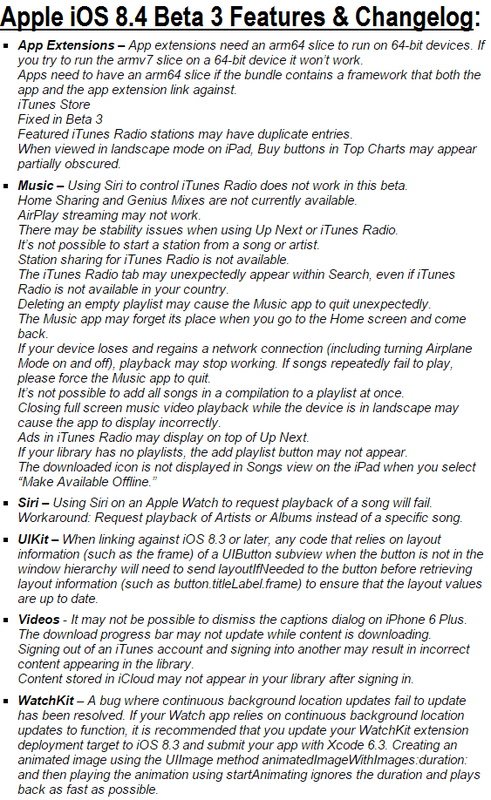 The official iOS 8.4 Beta 3 (12H4098c) release notes includes several fixes with new features and functionalities additions and changes such as; Videos app library, iTunes extras, iTunes radio stations in iTunes store and some display problems of iTunes store related bugs fixes etc. Apple iOS 8.4 Beta 4 is also under-development process. More you can read in below image! The latest Xcode 6.4 Beta 3 (6E23) release notes contain support for iOS 8.4 Beta 3 SDK and OS X 10.10 Yosemite SDK. The stable Xcode 6.3.2 GM (Build: 6D2102) version is also available on App Store. 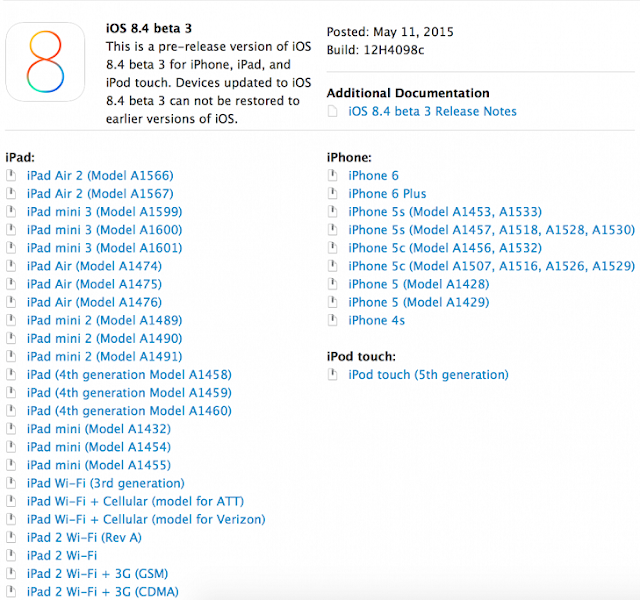 How to Install iOS 8.4 Beta 3 Update? 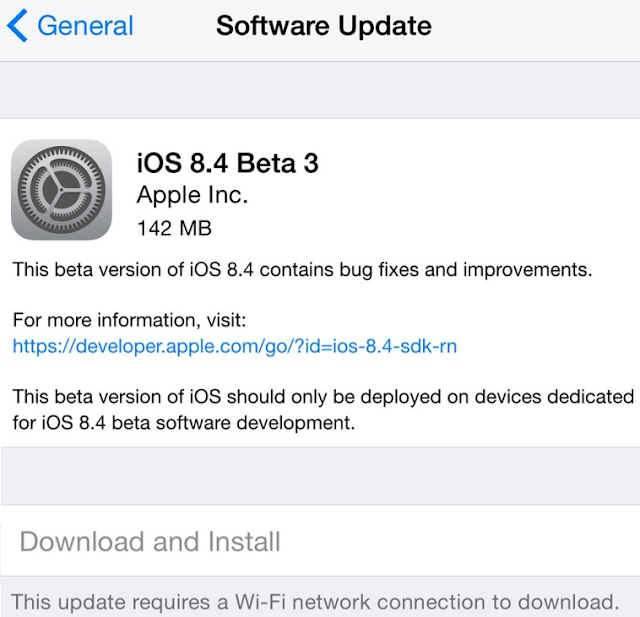 Apple iPhone, iPad and iPod Touch device users can get iOS 8.4 Beta 3 OTA Update (Over-the-Air) through Settings > General > Software Update option. All iOS developers can visit iOS Dev Center website for official iOS 8.4 Beta 3 Downloads, Whereas all iOS non-developers can manually install and activate iOS 8.4 Beta 3 without UDID developer account via iTunes for Free. Download iOS 8.4 Beta 3 IPSW Files for iPhone 6 Plus, iPhone 6, iPhone 5S, iPhone 5C, iPhone 5, iPhone 4S, iPod Touch 5G, iPad Air 2 6G, iPad Air 5G, iPad 4G, iPad Mini, iPad Mini 2, iPad Mini 3, iPad 3G, iPad 2G and Apple TV 3G via Direct Links below. How to Jailbreak iOS 8.4 Beta 3 Firmware? No Untethered iOS 8.4 Beta 3 Jailbreak is available by TaiG, PanGu and 25-PP iOS Jailbreakers team.